When DC announced that writer J. Michael Straczynski and artist Eddy Barrows were taking Superman on a walking tour of the United States in the "Grounded" arc that began with a short story in issue 700 and starts in earnest this week in issue 701, I defended the concept. I found the idea of Superman not using his powers and struggling with his place in a world full of people so weak and fragile compared to him far more likely to get me to read a Superman comic than the alternative, a power-fueled romp of the kind that keeps Metropolis' construction industry thriving no matter how bad the economy gets. I still will defend the concept as one that intrigues me. But it's the execution of "Superman" #701 that's flawed. Pretty much across the board. It casts Superman more as wandering preacher than as a man on a journey of self discovery. It shields his thoughts and motivations from the reader in a manner that's frustrating rather than mysterious. It rehashes scenes that have been done with the character before and does them much worse than the originals. And the bitter cherry of awkwardness on top of this sundae of failed opportunities is the continuing trend of DC poorly treating minority characters in a way I believe and hope is an accident.Superman's first stop in "Grounded" is Philadelphia, where he walks the streets of the city day and night offering aid in the form of x-ray vision, super speed and advice that jumps between zen and heavy-handed optimistic moralizing. Now, I'm not going to entirely condemn heavy-handed optimism, because if there's any superhero who feels right mouthing that sort of opinion to me, it's Superman. On some level it makes sense that a man who's capable of almost anything is going to champion the idea that fighting to make the world better in even the smallest way is a cause worth believing in and we should never give up on that hope. I don't disagree with that sentiment. Superman should be someone pushing others to be better than they believe they can be. But what bothers me here is that there's not much of an impression that Superman is struggling with the ideas that confront him in any way. When "Grounded" began, it seemed like Superman was leaving to rethink his life coming out of the incidents surrounding New Krypton. That's not what's on display here. Instead we see a Superman absolutely certain of the things he believes and using this trip as an attempt to share those opinions with anyone unwise enough to stop him and ask to talk. And that lack so far of any kind of internal conflict for the story's central character makes this much weaker than it otherwise could be. If that were the only problem with "Superman" 701 it would be a big enough flaw. It gets worse. The pivotal scene in the issue involves Supes talking to a woman who's contemplating taking her own life by jumping off a building. As far as the dialogue goes I didn't dislike this section as much as the rest of this book, and some of it did a decent job of conveying the ideas central to the work for Straczynski. The problem is that not too long ago Grant Morrison did a similar scene in "All-Star Superman" that I consider to be the best moment from the best Superman story told in quite some time. "All-Star Superman" is a book that has been both critically praised and heavily promoted by DC Comics, and it's hard to imagine a lot of people are reading this book who aren't familiar with it. It's more difficult to believe that the creative team responsible for this book never read "All-Star Superman," particularly when I'm ninety-five percent certain that Grant Morrison makes a cameo as a reporter following Superman on page 3. When the inevitable comparison is made, "Superman" 701's scene is severely lacking next to Morrison's masterpiece. And as a result the big emotional moment of the book falls so flat it brings the entire experience down. 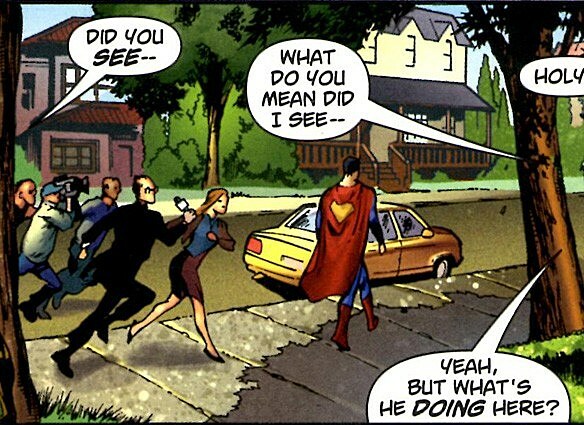 That's right, out of the three people in a car, it's the one black character who first urges the white driver to run the red light, only to have a grinning Superman guilt the three into obeying proper traffic laws on the next panel. Again, I don't think this is intentional, but I have to ask how this happened. I don't want to believe that in Stracznyski's script, characters' races were assigned for such minor roles and all the bad role model parts were specifically given to black characters. But that leaves two options. Either the art team of penciller Eddy Barrows and colorist Rod Reis read the script and decided that, clearly, those parts should be portrayed as black characters while others should not be, or the editorial team on the book made the decision. At the very least, the editorial team approved the book and didn't find anything wrong with this scenario. This isn't what makes the book bad, but it does make a sub-par book at times uncomfortable in addition to the rest of what's wrong with it. So am I giving up on "Superman" already? Honestly, I'll probably give it another issue or two. As a writer Straczynski can be extremely hit or miss, and while this book is certainly a miss I'm going to remain open to the possibility that a later issue will be worth it. When he does hit the mark he can be very good. It's too bad that in this case "Superman" 701 missed the bullseye, missed the dartboard, and hit the nose of the guy minding his own business and sipping a beer at a table five feet away. And then it lectured him.